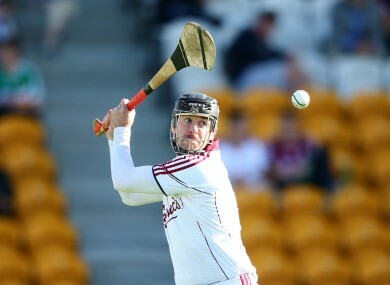 Colm Callanan has worked hard for the Galway number 1 shirt. GALWAY GOALKEEPER COLM Callanan has helped to transform the body of his understudy James Skehill, while at the same time attempting to keep him out of the starting line-up. The Tribes netminders are good friends off the pitch but are locked in a rivalry for the number 1 shirt. Callanan recently released pictures of Skehill’s remarkable body transformation and that work paid off when the Cappataggle man helped Galway to All-Ireland intermediate glory. But Callanan is the man in possession of the senior shirt and his form this summer has propelled him to the head of the queue for a coveted Allstar award later this year. Callanan was superb at Croke Park last Sunday, pulling off a number of vital saves including a penalty stop from Tipperary’s Seamus Callanan. The Galway netminder also kept out Lar Corbett with a breathtaking save and denied Patrick ‘Bonner’ Maher when the Tipp forward broke through on goal. Barring injury, he’s a certain starter in the final against Kilkenny on 6 September but Callanan is taking nothing for granted just yet. On the Friday night before the 2012 replay with the Cats, Skehill damaged his shoulder in training but still lined out, with Callanan called into the squad at the eleventh hour as back-up. “I didn’t really have an involvement, I wasn’t on the panel that year and I came in because James was injured,” Callanan recalls. Callanan admitted that it was a strange feeling when boss Anthony Cunningham picked up the phone and asked him to pack his gear bag for Croke Park. “I suppose it was, a county manager calls you in an hour of need, what are you going to do only try and see if you can help,” he said. In the three weeks before the final, Callanan and Skehill will go hammer and tongs in training to prepare for a defining showdown with the holders. The hope in Galway is that the Tribesmen can finally end an All-Ireland senior famine that dates back to 1988. And the healthy competition for places that exists in the Galway camp bodes well for their prospects. Skehill is the main threat for Callanan’s coveted goalkeeping slot but possession of the shirt is nine-tenths of the law. “Yeah he’s doing alright!” Callanan smiled. “We push ourselves very hard, that’s what we will always be about. “We are good friends and we just try and get on with it and make each other look the best we can. That’s the way you have to be. “Myself and James have swapped over down the years. “I’m there since 2007, he’s had a go at it and I’ve had a run at it, that’s the way it goes. Email “Beast mode! Galway goalkeeper has turned his friend and understudy into a 'ripped' rival”. Feedback on “Beast mode! Galway goalkeeper has turned his friend and understudy into a 'ripped' rival”.